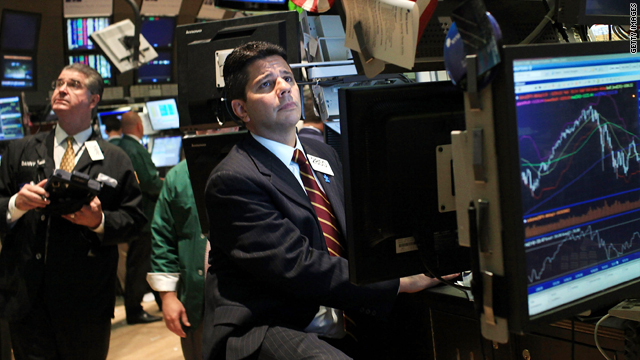 Traders work at the New York Stock Exchange this week when economic woes sent the Dow down nearly 270 points. He says long-term solution to unemployment is convincing firms to start investing in U.S.
New York (CNN) -- To get businesses to start hiring, President Obama needs to persuade them that the United States is still a good place to invest, says analyst Fareed Zakaria. Stock markets around the world have fallen sharply in recent months. U.S. companies are doing only a modest amount of hiring and consumer confidence has fallen. And, Zakaria says, executives fear that the U.S. under the Obama administration is no longer a place that encourages business investment. "There's a sense that whenever he speaks about them it is only to bash them, only to accuse them of greed or something like that, and then there are all these assertions of greater regulatory power, the assertion of governmental power over everything from the banks to BP to the auto companies," Zakaria told CNN. "I think Obama was dealt a bad hand. You had to do something about the car companies, you had to do something about the banks, you had to do something about BP. But now he needs to recognize that the collective effect of all that has been to scare businesses." Zakaria said that business leaders he's talked to, most of whom supported Obama's campaign, have "a feeling that he really doesn't get what they do in the private sector. He has no trusted adviser who comes out of the private sector. It's the first time you have no CEO in the Cabinet; it's the lowest level of business representation in government in at least 60 or 70 years." CNN: Is the U.S. economy headed for another dip after what seemed like a recovery from the Great Recession? Fareed Zakaria: I'm not a forecaster, but this much we can say for sure -- that the economy remains very weak, that there is very little private-sector growth taking place. ... The economy remains weak despite the fact that you have interest rates at absolute historical lows -- they're close to zero and despite the fact that you have a Federal Reserve that is actively trying to facilitate growth, and that's the part that is worrying. CNN: Some experts are saying that the stimulus has failed, and that it could have been better designed. Do you agree? Zakaria: I think that the stimulus could have been better designed, but there's no question it had the effect of averting a disaster, and if you look at the chart of how much the GDP [gross domestic product] was contracting before the stimulus money started kicking in, it had a very substantial effect in arresting the decline and turning the economy around. Could it have been more effective and less political? Absolutely. The problem, of course, when one says that ... is would it have passed if you had designed this perfect stimulus? CNN: We're in the midst of a great debate that seems to be raging worldwide, not just in the U.S., between boosting government spending to spur the economy and cutting government spending to pay down debt. Who's right? Zakaria: First of all, I think it's probably the most important policy debate that is going on in the world right now. It's probably the most important policy debate we've had in a generation because the stakes are very high. Getting this right is the difference between another recession, perhaps prolonged slow growth, a kind of Japan-like scenario versus getting the economy back on track. CNN: What's the right course of action? It's probably the most important policy debate we've had in a generation. I think the key is you have to couple that with two things for this to work. You have to couple it with an announcement of a plan over the next seven to 10 years to dramatically reduce the deficit. CNN: Why is that important right now? The third part, the heart of it, is that you have to create an environment in which businesses are willing to invest money in the United States. This in some ways is the absolute key. At the end of the day, government spending can only be a temporary measure. It is a bridge to the private sector investing in America and creating jobs. CNN: Why aren't businesses investing and hiring in great numbers? Zakaria: There's a huge amount of uncertainty around. There's uncertainty about the after-effects of the financial crisis ... but there's also a lot of uncertainty about new regulations, new taxes, new costs related to health care, and the Obama administration really has fed all those fears by not providing a sense of clarity and leadership on this. I think if the president were to think to himself that his job is to get the private sector to invest in America and ask himself what would it take to do that -- it would mean creating an environment in which businesses felt they could easily and profitably invest in America versus investing in China, or versus investing in Poland. This is now a global arena, and the United States has to be a more attractive alternative than other places. We have the highest corporate tax rate in the world. It used to be the second highest, but Japan just cut its corporate tax rate. We have to realize that these things have an impact. We have all this uncertainty about regulation, whether it's the EPA [Environmental Protection Agency] or the FCC [Federal Communications Commission] every day announcing plans for new regulations. Now in any particular case, there may be an argument for that regulation, but the overall effect is you're creating an environment in which business feels unsure about the future, and in that circumstance what they do is they horde cash rather than spending it. CNN: Some people say that in response to that kind of argument that what the Obama administration is doing is really a corrective to years, or even decades of deregulation, that brought us the financial crisis or the BP oil disaster? There's too much emphasis placed on the idea that regulations will save us from the next crisis, but the one thing we can be sure of is that the only way you'll have a sustainable recovery is if you get businesses to invest. CNN: Why does it matter if business leaders are scared? Zakaria: A business leader in New York who voted for Obama -- supported him very strongly -- said to me that the White House will claim that this is all about perception. But if the CEOs of the top 500 companies in America perceive it, their perception becomes your reality. Because if they're unsure, uncertain and cautious, they're not going to spend any money and that means the economy doesn't grow. This may sound like just image management, but it has a very profound consequence. CNN: Do American political leaders have the political will to carry through on the kind of economic plan you describe? Zakaria: This is the most serious crisis we've faced since the Great Depression. We cannot take the attitude that what makes the most sense economically is something we can't do politically. We can't resign ourselves to the idea that the only place that can have a sophisticated economic policy is the Chinese dictatorship, that American democracy can't do it. We have to. The stakes are very high here. Obama said during the campaign, said the debate is not really about small government or big government, it's about smart government. This would be an opportunity to demonstrate smart government in action.